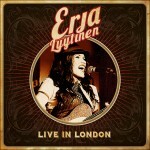 Share the post "Album review: ERJA LYYTINEN – Live In London"
Erja Lyytinen matches her excellent guitar playing with wide ranging material that broadens the blues canvas to take in a much wider perspective. She’s a strong lyricst who imbues her songs with deep emotion and meaning, facets not always readily evident on the contemporary blues-rock scene. Erja has been dubbed the ‘Queen of the slide guitar’, but her talents extend well beyond such a catch-all strap line. Erja pens heartfelt songs that she lives to the full on stage. She also carries her essential life force into four Elmore James numbers that start out as dutiful covers, but are transformed into something all of her own. This is rendered possible by her road tested band which features a drum-tight rhythm section and a subtle accompanying guitarist Davide Floreno. He knows when to play rhythm, when to add tonal colours and when to solo, which he does with some elan. The band initially follows her on the segued acapella gospel opening of Fred McDowell’s ‘It’s A Blessing’ and the wah-wah inflected ‘Let It Shine’ (given its full panoramic scope over a Bo Diddley beat), but as the set builds up a head of steam the band pushes her to the peak of her abilities. And it’ s in the middle of some truly epic soloing that she reveals her real quality. She subtly layers her tones, adds vicious slide lines and contrasting clean tones and then interlocks with Floreno on solos that express the kernel of the song, rather than just being an exercise in aggregate noodling. On ‘Let It Shine’, her guitar work conjures up a jangling quality, while on ‘Person To Person’, she adds a dirtier tone before ripping through the song with some slashing slide that would make old Elmore chuckle in his grave. There’s a subtle funky undertow to her own ‘Grip of the Blues’, a crossover number which combines insightful lyrics with intricate musicality, as she adds the deftest of wah-wah solos. There’s also no denying the melodic pop sensibility of ‘Change Of Season’ which is full of chiming tones and her best vocal of the night. The song moves from a balledic intro to an intricately woven guitar line that could be Jerry Garcia and ultimately reveals itself as a southern rock piece, before a gentle drop-down. The steam rolling shuffle ‘Everything’s Fine’ comes complete with delicate harmonics and a subtle break-down, that sees her crouch at the front of the stage to rebuild the song with an angular solo, leading to a drum-tight finish that brings a deserved response from the crowd. ‘Hold On Together’ takes the long route home, before the hook gives way to a short brusque solo, and shared conversational guitar lines with Davide. She spontaneously encourages the crowd to join her on the chorus and her smile at the tricky end of the song rightly suggests a job well done. If there’s a problem its simply that she sometimes over sings and her vocals don’t always carry her to the the places she might wish to go, but hell, that also applies to a raft of her guitar playing contemporaries. She dips back into her own Elmore James tribute album ‘The Sky Is Crying’, to give herself plenty of opportunity to dazzle us with her slide playing, but after 7 or so albums of her own material, it seems like an attempt to broaden her marketability rather than an inspired choice. When she finally plays the title track iof the same album, it’s full of space, dynamics and an impassioned vocal while her weeping slide conveys just as much emotion as any vocal could. The best moments of ‘Live In London’ come with the combination of her own songs and a vivacious performance that demands our attention and draws us in. She embraces the sort of moments of wild abandon that used to carry the younger Buddy Guy through, and just when she appears to have left her band behind, she re-addresses the balance by focusing on her slide playing. Yes indeed, nothing but the blues, played fearlessly, passionately and without a safety net, save for the confidence in her own abilities and that of her band. She’s equally intense on ‘Dust My Broom’ – riding rough shot over her band’s disciplined support - but crucially she connects with the crowd. This entry was posted in ALBUM REVIEWS, ALBUM REVIEWS (Mobile), All Posts and tagged album review, blues, Bo Diddley, Buddy Guy, Davide Floreno, Elmore James, Erja Lyytinen, Fred McDowell, funk, guitar, Jerry Garcia, Live in London, southern rock. Bookmark the permalink.